Hair color is a great fashion statement which can be fun and stylish at the same time. Guys with colored hair are definitely head turners weather due to the attractiveness or the eccentricity. Men have gone to lengths to experiment with their hair and now you may even see some guys with blue hair. Due to advancements in hair dye products and variety of styling processes, men, too, can now color their hair in various ways, which helps to highlight their features or give them a whole new look. No makeover is complete without modifying the natural color of your hair, and the best part is that there are so many ways in which you can do so. You can either change the color of your whole hair by using dyes or partially style it by streaking or getting highlights. No matter what you choose, there has a lot of hair color for men nowadays. What do you want? Have a look in magazines and online and take the images along with you to consult a colorist. Of course, you have the option to do it yourself with a home coloring box, but you run the risk of it going wrong and damaging your hair. So be safe and speak to a stylist. Style and color work hand in hand with each other so choose a shade that will suit your personality – and of course if you are opting for something radical it will need to be suitable for your job too. Skin tone is a big thing when considering color. If you have very pale skin, then dark hair colors will wash you out. Before visiting the salon to have your color done, prevent washing your hair for 3 or 4 days beforehand. In doing so, the natural oils will build up in your hair and create a natural protective barrier against chemicals and bleach. Coloring can cause some damage and dryness to any hair. If you have weak, brittle or thinning locks then you will want to stay clear of heavy coloring especially where bleaching is concerned as it is a very harsh chemical. In the weeks following your dye job ensure that you intensively condition to help repair any damage. Coloring your hair is more than just about covering up grey. Men can often look very distinguished and gentlemanly with a salt and pepper coloring. So, if you do want to downplay your level of greyness then consider opting for something more natural rather than a bold block color. Dark block colors can end up looking very unnatural and synthetic. Ensure that you reconsider your shampoo and conditioner and invest in products that will maintain the vibrancy of your color and protect against dulling and fading. Bleached men’s hair colors react well to purple toning shampoos as it works as a preventative measure against the hair turning a yellow/ orange tone. Whichever hair color for men you chose, make sure it goes with your tone. Some colors go with most skin tones- dark brown is one of them. To get the dreamy look, you could consider blonde or chocolate brown. Also, you might want to consider your life in general for example, if you work in a law firm, you definitely cannot walk in with the red or rainbow colors, can you? So choose wisely as it will have an impact on the way you are perceived. And whatever, you do, make sure to carry it out with confidence. So, whether you want a few low-lights or highlights or full-on color, we have got it covered – so check out these amazing men’s hair color ideas with both short and long length hair. Merman hair is a very on-trend look for fellas and features a mix of bright colors cleverly blended into the locks. Ideal for: Guys after a bold and distinct style and don’t mind a lot of up-keep. How to Style: Color choice is very important here so that the tones mix well together. Dark hair works better with warmer darker tones otherwise the color can look quite jarring. Textured crops are a great way to add interest and drama to straight hair – and the choppy crop with highlights is a great way to enhance this men’s hair color style. Ideal for: This cut looks good with most face shapes – particularly great style for those who have thinning hair or very straight hair that needs added volume. How to Style: The less you do with this naturally messy look, the better it will be. Mousse is a great way to add texture, however, remember you are looking for a styled and controlled messy ‘do – not a scruffy look! The choice of medium brown color here brings out the natural complexion and this is a hairstyle that can complement a variety of skin tones. When done right, grey can look very debonair. Coloring hair doesn’t have to mean full color, splashes of vibrancy can look great too. Ideal for: Any man starting to grey. How to Style: Run some thin or medium thickness grey highlights through the length of the hair for a natural look that’ll blend well with your naturally greying hair. This is a deliberately jarring choice for guys with colored hair that pairs well with the natural dark undercut, dark facial hair and peroxide top. Ideal for: Summertime beachy vibes. How to Style: This would work well with a fauxhawk or disconnected undercut. Bleach the upper portion of the hair stopping where the line of the undercut sits. Ensure you use a purple toning shampoo to avoid brassiness. This guy with colored hair look is a stunning color choice based on the natural hair tone and skin color. It is also set off nicely by the temple fade and thick beard. Ideal for: Afro or naturally curly hair. How to Style: Ask your barber to cut in a fauxhawk style ‘do with a temple fade contrast around the ears. Pair with a blonde hawk section and leave naturally curly for added volume and drama but ensure the shade of blonde suits your skin tone. This is a very daring cut and men’s hair color that results in a very edgy style. Ideal for: Guys who don’t mind a style that requires a fair amount of upkeep and daily styling. How to Style: This fauxhawk features distinctive shaved styling along the sides of the head and grey-white striping across the crown. This will take some painstaking styling to ensure the stripes stay in situ – if they blend out into the rest of the hair it could just look messy. You will need to keep on top of your barber visits to keep this looking neat. A more natural color choice which is highlighted by the pointed cut. The variations of this look are endless as you can opt for any length cut to suit your face shape and personality. Ideal for: Great hairstyle for round faces but choose a longer style on top to balance out the face. Good for square and oblong face shapes too. However, add more of a relaxed bang for these shapes to soften the features. How to Style: By using a wax or stronghold pomade you can structure the hair up into a point, however the key to this look is keeping it relaxed so to avoid being too precious about the final styling. The undercut is a foolproof way to add volume and definition to any style and this look is given an added pop with a bold and brazen color. Ideal for: Thin hair. Long or round faces. How to Style: There are endless shades of pink available and not all will suit all skin tones so seek advice from your colorist. Fade the pink into the undercut softly for a less jarring and natural look. Keep the hair untamed and relaxed to finish off this style. This is gorgeous take on flame coloring which is has been hugely popular of late. Paired with a very neat cut, it makes for a conservative yet daring style. Ideal for: Red pairs very well with naturally dark hair and skin. How to Style: Run red coloring through the lengths of the top of the hair. The contrasting dark roots help to add volume and structure to this cut. These options show that your choice of color can enhance the texture of the hair. Ideal for: Younger chaps who want a low maintenance look. How to Style: Keep hair longer on the top and fade at the sides. Opt for a natural color choice that suits your skin tone, adding subtle highlights and layering can enhance the thickness of the hair. A simple taper fade cut with a defined side part is really highlighted by the choice of color here. Ideal for: Those who want a conservative cut with a quirky edge. How to Style: This is almost two hairstyles in one – with the stark coloring and the hard part making a distinctive contrast however it blends so well together thanks to the heavy tapering and smart color choice. Use a purple toning shampoo to prevent brassiness. This is a simple take on a comb-over for very thin hair with a receding hairline. By adding a contrasting but natural color around the top of the head, it adds much-needed texture and volume. Ideal for: Thinning hair or very strong hairlines. How to Style: Clever color choices can add texture, volume, and movement to hair so speak to your colorist about what would work best for you. Warmer and darker tones tend to work help add depth and thickness to hair. Running simple highlights through the length of the hair is a fast and easy way to pimp up any hairdo for guys with colored hair. Ideal for: Naturally curly or wavy hair. How to Style: The dyed blonde hair adds texture to the locks. By keeping the hair short on the sides and adding naturally curly length to the top you can add striking volume. You will need a pomade or wax to keep those waves in tip-top condition. Pastel shades are not just for women and when properly done look great on men. Ideal for: Pastel colors can wash out fair complexions so make sure your color choice matches your skin tone. How to Style: Make sure that you have these sorts of tones done properly so you avoid it looking like a faded mess. These color choices do require frequent upkeep as they wash out easily. Speak to your colorist and use appropriate shampoo products for your tone. The quiff continues to be a very popular hairstyle and this is a modern take on the 1950’s classic. Ideal for: Straight hair or hair that needs a boost of volume. How to Style: The quiff is all about sky-high structure and this is enhanced by clever highlighting around the forehead to add definition within the quiffed portion. The style will take some daily work – with a stronghold wax and blast of a hairdryer you can achieve the sweeping quiff look. Pastel hues are not just for girls so don’t be afraid to consider the entire rainbow of hair colors available! Ideal for: Round faces that need shaping. How to Style: Whatever color you choose to dye your hair, colored hair paired with bangs can make for a great look. This style falls in a natural side part with a relaxed fringe falling across the forehead. The natural cut paired with the dynamic color choice makes for a unique look. Olive skin tones work better with warmer colors and should avoid hyper blonde or cold hues – consider an ombre color as shown here. Ideal for: Darker skin tones. Round faces that pair well with high volume and sweeping fringes. How to Style: This is one to speak to your colorist as achieving the right ombre color takes some skill. By using a serum, it can add high shine which works very well with the color choice. The pompadour with fades continues to be a great option for men who have straight hair but like to maintain a dramatic amount of length. Ideal for: Straight hair. Oval and round faces. How to Style: The key to a successful pomp is volume and height and this is enhanced through the clever use of highlighting the hair around the crown. You will need at least 4 inches of hair to achieve the look. By using a large barrel brush, blow dry from the roots to create volume. If you have a punk or rock star tendencies, then you can’t go wrong with the classic long hair mixed with stark red tones. Ideal for: Guys who like to turn heads. How to Style: By dying the main portion of the hair a bold and brilliant red, add contrast with an undercut left in the natural hair color. If you are feeling particularly brave why not dye that beard too! This is a great hair color for men with long hair. 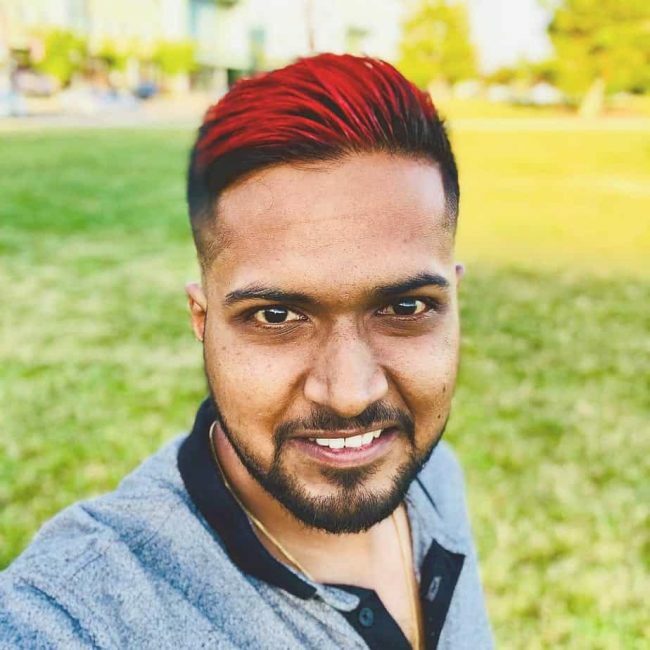 This guy with colored hairs takes on women’s dip dye or balayage hairstyle. Ideal for: Dark skin, dark hair, and bold-face shapes. How to Style: Dark skin and dark hair can sometimes look quite intense. By adding warm blonde hues through the ends of the length you can create a sense of warmth and movement. The choice of a golden brown/blonde here is key. The beard and naturally messy hair really compliment the look too. Dyeing one’s hair is a great styling idea. Hair dye kits are easily available in the market and if you follow all the steps, they are quite easy to use. Select the type of hair dye, like permanent, semi-permanent, progressive colored dye etc. Brush your hair well and wrap a towel around your shoulder so that it does not stain your clothes. Make a small section near the ear or temple to test the dye. If you don’t have any adverse reaction, mix the dye liquid or powder according to the instructions and use a comb, brush or your gloved fingers to apply it in small sections. Some hair dyes need to be kept for only 15 minutes and for some you may have to wait for an hour. Wash your hair thoroughly, apply conditioner and dry your hair naturally or with the help of a hairdryer. Another idea is bleaching your hair. Bleach is mainly used to lighten the color of the hair. Some men prefer the blonde look or want to highlight their hair, and bleaching is an easy way to do that. There are many popular hair bleaching products for men. Choose a good quality one, especially if you have natural black or dark brown hair, as excessive bleaching can make it look orange. Mix one part peroxide with one part powdered bleach and only use plastic mixing brush and plate so that there is no negative chemical reaction. Put on plastic gloves and apply the bleach from the tips toward the scalp. Since the heat from the scalp makes the dark hair bleach faster, we apply it at the ends of the hair first for even coloring. Avoid contact with skin. Rinse hair thoroughly and apply an intensive hair conditioner to nourish your hair. You can also get the frosting effect by bleaching the tips so that the short spiky strands stand out. Niall Horan’s hair color definitely stands out with golden-purplish shade. While Bobby Idol decided to go for a blonde to compliment his looks. And Tony Kanal went Golden on the top with a tinge of white by the sides. The silver hair color by Henry Holland is something one must try men’s hair color in anyone’s lifetime. Would you try this guy with colored hair of darker golden brown with undercut? There are various ways of streaking hair depending on the color of your hair and the look you want. You can choose a men’s hair color that is close to the natural color of your hair, blonde shades or bright ones like red, blue or neon colors. Decide where you want to streak the hair and how thick and wide the strand should be. Apply bleach and let it work for a few minutes, rinse it and apply the hair color after mixing it in right proportions. Always use aluminum foils to place the hair so that it does not touch your skin or the rest of the hair. Wash hair properly and condition well. Big hair with a blonde streak on the front. Jared Letto long hair with red streaks. Adam Lambert blue streaks hair. Rainbow hair means applying all or less of the seven colors of the rainbow, violet, indigo, blue, green, yellow, orange and red to style your hair. Guys with colored hair usually do it in the form of a mohawk or color their whole hair in these seven shades by making separate sections. 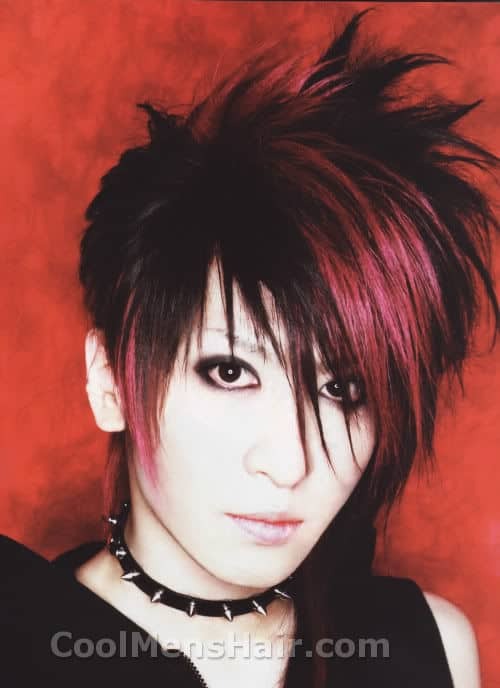 Sometimes the hair is styled in spikes so that the hair stands up and the colors are distinctly visible. Also remember to bleach your hair before applying the colors a few days later, if it is not naturally blonde so that the colors appear bright and vivid. It is one of the boldest hair fashion statements but it is also very fun and will definitely make you stand out. Great article. I noticed that you named the guys whose photos you used that you knew. “Undercut hair with blonde side,” is Key from the band SHINee. It would be great to see more articles about K-Pop hairstyles.